The 16 gauge galvanized steel construction of the Go Rhino RB20 running boards provides exceptional strength and durability. Metal being galvanized means that there is a protective layer of zinc. Zinc is an incredible metal that is creates a shield against corrosion when added to steel. There are two finishes available, textured powder coat and a protective bed liner coating. The RB20 features a closed fully welded boxed end design. This keeps debris and obstructions from damaging the end of the board. Boxed steel is the most reliable option, especially when compared to plastic or stamped end caps. The close fit of these Go Rhino side steps provides a sleek look and increased ground clearance. Ground clearance is important for any vehicle used for off-roading or harsh working conditions. The higher mounting position allows you to tackle uneven terrain confidently. Running boards with a wide stepping area make for easy entry and exit of the vehicle but they provide more than just that function. 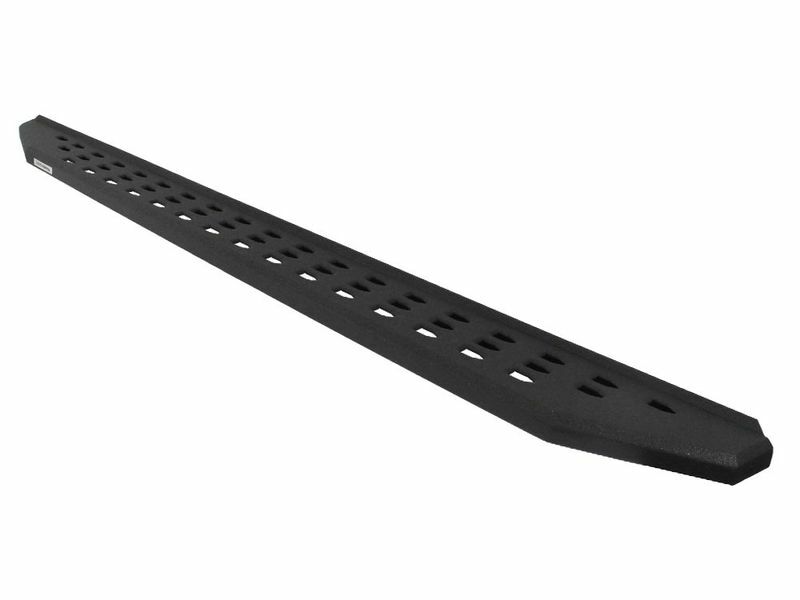 The wide step design will help shield your vehicle against damage from road debris. The step width may deflect some of the debris that your tires sling up towards the vehicle. The specialized tread pattern on the Go Rhino RB20 allows dirt and debris to pass through keeping the step area safe and usable. Inclement weather conditions and rough terrain can cause many steps to become caked or clogged greatly reducing grip. The unique tread pattern on the RB20 design prevents build up, allowing you to enter and exit your vehicle safely. Check out the all new Go Rhino RB20 Running Boards. These heavy duty side steps take it a step further by providing a wide and secure stepping area without comprimising looks. Modeled after the factory boards you'd find on a Ford Raptor, RB20 boards have an aggressively textured black polyurethane finish. These cab-length running boards provide a 5 inch wide step that is slip resistant in any weather. Go Rhino uses 16-gauge steel that is extremely durable and will protect your rocker panel and lower door from flying rocks and mud. Installation is easy with no drilling, and takes about 40 minutes to install. This kit comes with 3 custom fitted brackets that are as strong as factory and make these running boards the last you'll need. The Go Rhino RB20 Running Boards come with a 5 Year Warranty.